Mr. Justice Frank Clarke was appointed the 12th Chief Justice of Ireland on the 28th July, 2017. Justice Clarke was born in Walkinstown, Dublin in October, 1951. He was educated at Drimnagh Castle CBS and University College Dublin where he was awarded a B.A. in Mathematics and Economics (1972). He has been appointed as one of seven members of the panel which exists under Article 255 of the Treaty on the Functioning of the European Union that opines on the appointments of judges to the Courts of the European Union in Luxembourg, such appointments requiring a nomination by a member state followed by an opinion from the Article 255 panel. Speaking (at Fordham University NY in September 2018) about this, Justice Clarke said " While that panel does not have a veto over the confirmation of the nominated judge there has never, in practice, been a case where a nominated judge who received a negative opinion was ultimately confirmed. It would be fair to say that it has a de facto, although not a de jure, veto power. It has always been considered appropriate that one of the seven members of that panel should come from a common law country but until this year that role has always been filled by a member of the UK Supreme Court. However, when the term of office of Lord Manse, former Deputy President of the Supreme Court of the UK, came to an end the Council of the European Union did me the great honour of nominating me to fill what one might call the common law slot on the panel". Having completed his legal studies at King's Inns he was called to the Bar in 1973 and to the Inner Bar in 1985. He practiced mainly in the commercial and public law fields (including constitutional law) and was twice appointed by the Supreme Court as counsel to present argument on references of Bills to the Supreme Court by the President under Article 26 of the Constitution. He also acted as counsel to the Public Accounts Committee on its inquiry into the DIRT tax issue and was external counsel to the Commission to Inquiry into Child Abuse (Laffoy and Ryan Commissions). While at the Bar Mr. Justice Clarke served for many years on the Bar Council including a term of two years (1993-1995) as its Chair. He also served as Chair of the Council of King's Inns from 1999 until 2004. He was a member of the Council of the International Bar Association from 1997 to 2004, serving as co-Chair of the Forum for Barristers and Advocates (the international representative body for the independent referral bars) from 1998 to 2002. Mr. Justice Clarke has been a Bencher of the Honourable Society of the King's Inns since 1994. He was elected as an honorary member of the Canadian Bar Association in 1994, and admitted as an honorary member of the Australian Bar Association in 2002. He was appointed a judge of the High Court in November 2004. He was mainly assigned to the Commercial list of the High Court, and also presided over the establishment of the Chancery and Non-Jury List in Cork. While a judge of the High Court, he was chairman of the Referendum Commission on the 28th Amendment of the Constitution (Lisbon Treaty II) in 2009. He was appointed a judge of the Supreme Court in March, 2012. Since 2013, he has been a representative of the Supreme Court on the Association of Supreme Administrative Courts of the European Union. On his appointment as Chief Justice, he became a Member of the Network of the Presidents of the Supreme Judicial Courts of the European Union. Chief Justice Clarke has been selected for appointment, commencing in March 2018, as a member of the panel provided for in Article 255 of the Treaty on the Functioning of the European Union, the function of which is to provide an opinion on the suitability of persons for appointment as Judge and Advocate General of the Court of Justice and General Court of the European Union. 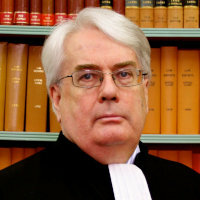 In the academic field Mr. Justice Clarke was a professor at King's Inns from 1978 to 1985 and has been Judge in Residence at Griffith College Dublin from 2010 to date. He was appointed Adjunct Professor in the Law School in Trinity College, Dublin in September 2012, and Adjunct Professor of University College Cork in 2013. He was awarded the Griffith College Distinguished Fellowship Award in 2017.